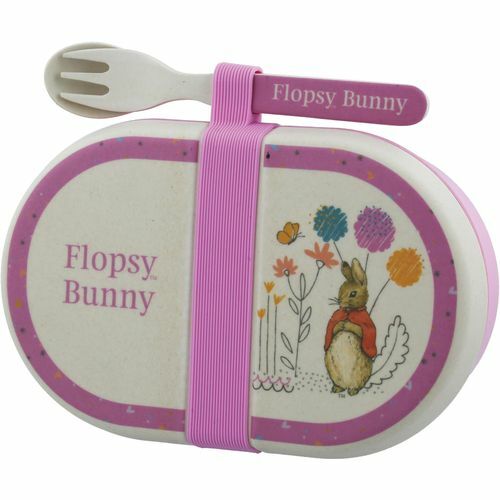 Brighten up a back to school packed lunch with this adorable Flopsy organic bamboo snack box and cutlery set. This little snack box is the perfect size for a sandwich or a healthy fruit snack. Ideal to keep your little ones happy when out and about, on day trips or for a family picnic. Did you know this product is multifunctional? It could also make a brilliant place for storing crafts, crayons or little toys. Border Fine Arts have been producing The World of Beatrix Potter giftware since being granted a licence in 1987, since then the collection has grown to include many different formats. Makes perfect gifts for children, or even christening gifts. This fresh and natural, eco friendly snack box is 7cm in height and 18cm in width. Snack box lid is not leak proof. Avoid use with liquid foods.